The Leadership Giving Program has been a significant part of our annual campaign for decades, making a difference in the lives of so many in our community. We value your gift and work diligently to invest it where it is needed most in the community. By being a Leader you know you are making a meaningful and measurable difference. You will also receive a tax receipt, tax benefits*, and invitations to exclusive events hosted by local leaders. Your professional advisor can give you the best advice regarding tax benefits. 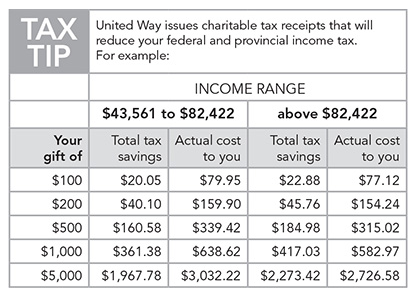 You can also visit the the Canada Revenue Agency website to use their Charitable donation tax credit calculator or use this tax tip chart to learn more about charitable donations. The Government of Canada is offering an enhanced tax incentive of an additional 25% in tax credits on donations by first time donors and donors who haven’t claimed a donation since 2007. To learn more about the First Time Donor’s Super Credit, visit the Canada Revenue Agency website. Gifts from our Friends of the Way (donors who give between $500 – $1,100) are a critical part of our annual campaign. In 2017 we were proud to have 634 Friends of the Way donors who contributed over $403,000. Thank you to the following ‘Friends of the Way’ for being generous in their donation and for giving people in our community the chance to live with hope, dignity, and a sense of belonging.